Back in 2012 we visited the Gobi Desert, but there are four smaller deserts to the south and west of it which are also well worth exploring. Travelling east to west, we begin with the Tengger Desert. 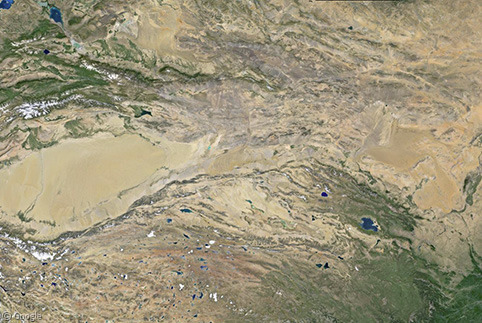 As with the Gobi, these surrounding deserts all have areas of stunning natural landscapes, interspersed with significant human developments. 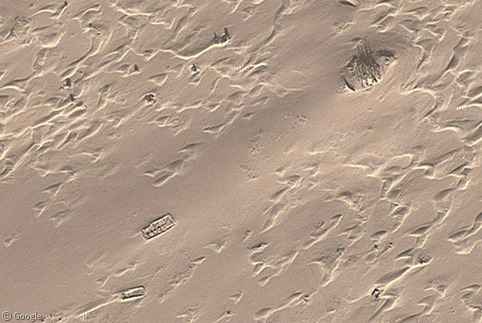 Patches of high-resolution imagery allow us to see areas of sand dunes and small lakes in great detail. 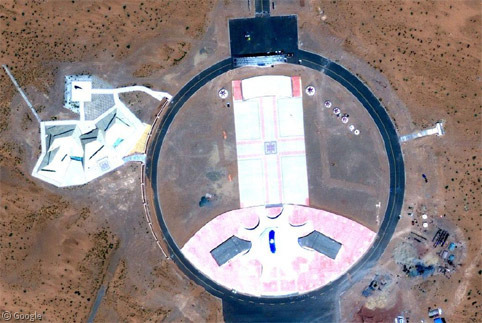 One of the larger bodies of water – Moon Lake – even has a luxury resort hotel for those wanting to explore the desert in comfort. Accommodation options include round Mongolian yurts. 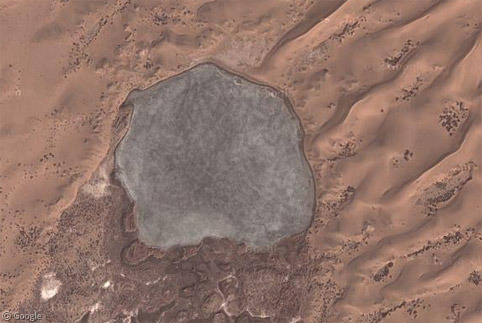 Desert lakes are often very rich in minerals. 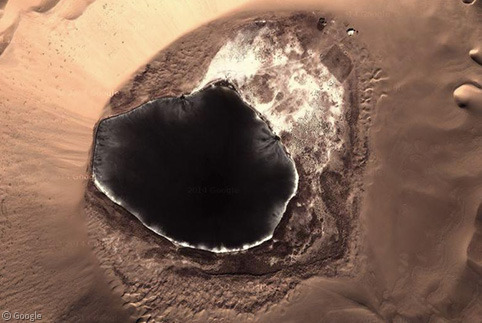 I think this one is used as a salt farm. To the north-west is the Badain Jaran desert. 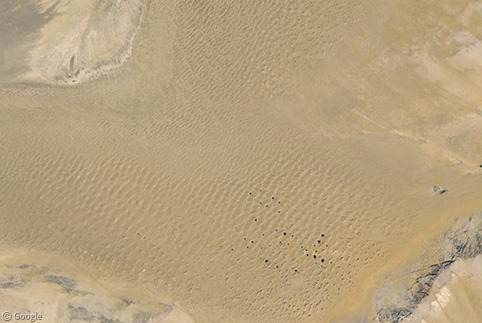 Badain Jaran has some of the most beautiful dune patterns that I’ve ever found while writing about deserts. 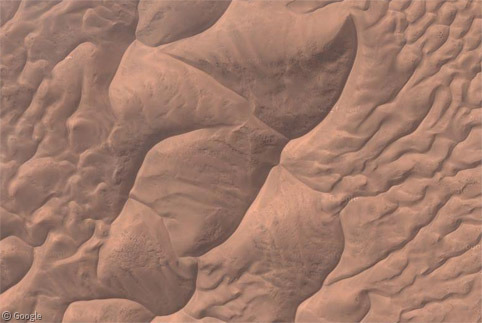 It is home to the world’s tallest standing dunes, up to 500m (1600′). 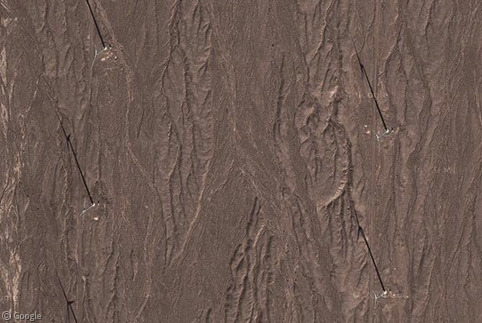 These are sand dunes which stay in place despite strong winds, held static by underground water sources. 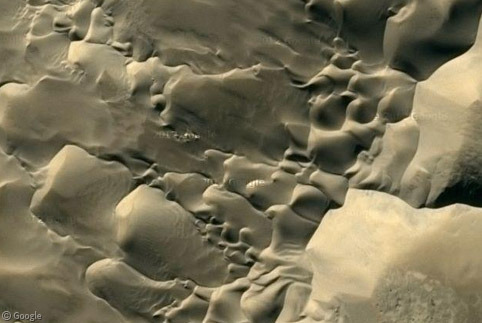 Some of them are also ‘booming’ (or ‘singing’) dunes – where the movement of loose surface sand over compacted internal sand creates unusual sounds. Sliding down downs is a good way to get the sounds going. I wasn’t able to find video of Badain Jaran (which doesn’t get many tourists) but there are plenty of examples from other deserts, such as this YouTube video. 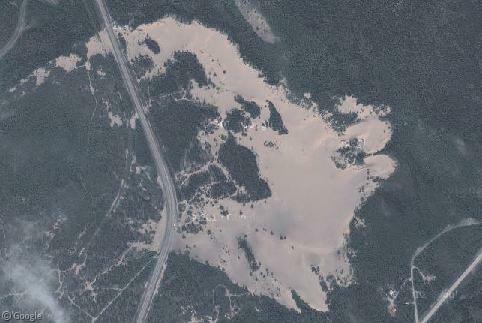 The southern part of Badain Jaran has more than a hundred very small lakes, with mineralisation clearly visible in many of them. 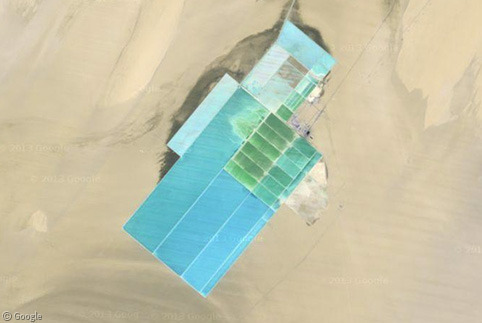 And there are several salt farms in the region. 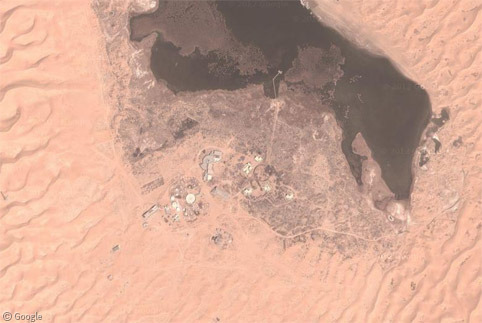 The desert is exploited much more harshly just to the north-west where an oilfield appears to be polluting a large area. 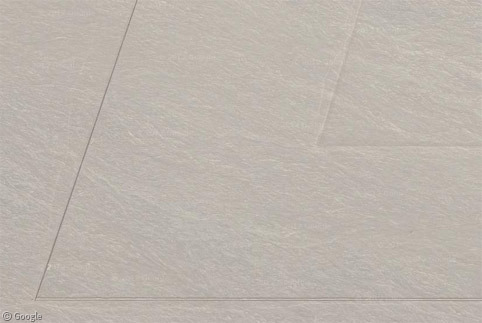 One of the biggest developments in the Kumtag is the Gansu Wind Farm – a series of power generation facilities consisting of hundreds of wind turbines. 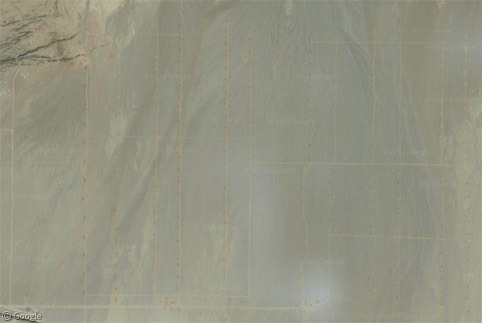 There appear to be three separate locations on the current satellite images – from a distance they appear to be just grids of roads, but zooming in reveals networks of turbines. 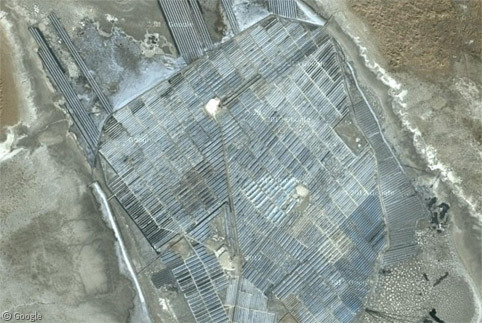 We can also see a large number of solar power panels in the same area. 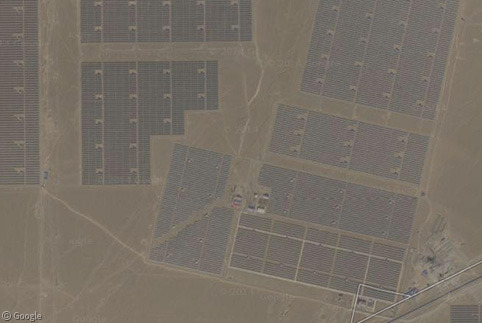 In a desert region, wind and solar must be excellent methods of generating power for China’s huge population. One of the most photographed locations in this region is the Crescent Lake oasis. Its natural beauty is threatened as the lake level has dropped significantly in recent years. 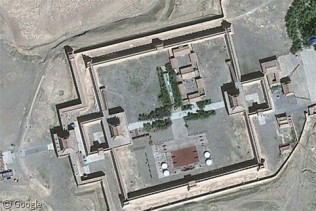 There are a number of significant sights near Jiayuguan City, including the westernmost segment of the Great Wall of China, and a well-preserved fort. 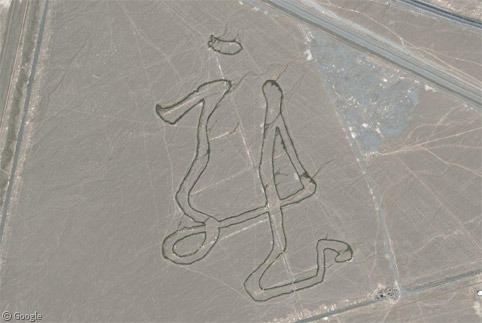 … and numerous unexplained strange markings in the earth. 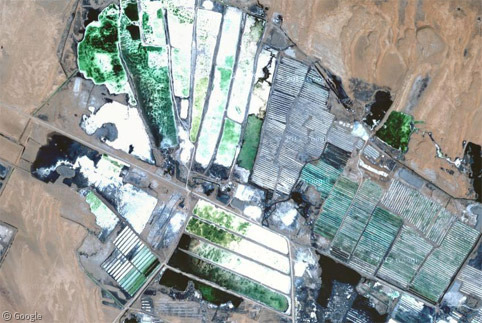 … and several salt/mineral farms, including this vividly-hued site. 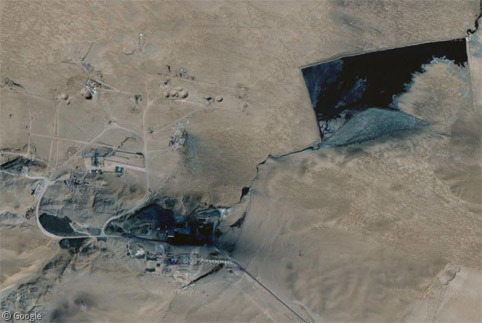 The military presence here is not as heavy as the Gobi desert, but there are still some facilities, including one in the Taklamakan Desert which is surrounded by a large trench and mounds of earth, with a fence running parallel a few hundred meters away. 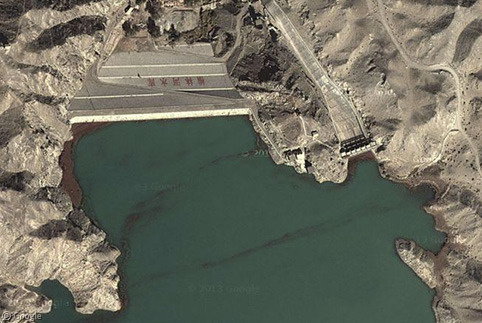 There are numerous destroyed buildings, this strange configuration of structures (mock planes in storage?) and an antenna array. 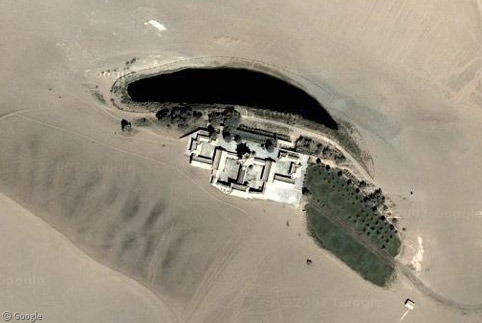 Finally, there are also ancient relics in the Taklamakan desert. The Tarim mummies (Wikipedia) were found in various locations and date back between 2,000 and 4,000 years. 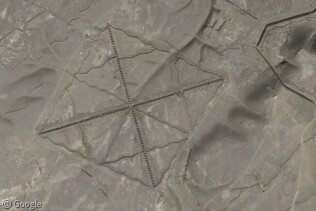 In one particular location, a number of tombs have been revealed in the desert sands, though their contents have long since been removed to museums.